← Quilters in Salt Lake learn about Days for Girls! I just went out and got the mail. A box from Nevada filled most of the mailbox. I pulled it out and smiled, remembering a lady I met several weeks ago at the fabric counter in Walmart. She was there buying a small remnant piece of fabric. She looked down on her luck and told me she was passing through town with her husband, who was waiting a few aisles over. He was wearing a tattered sweatshirt and had a thin ponytail. I was there, checking the clearance sections for fabric for DfG kits, and I’d pulled several bolts out that would be nice for shields–dark stain-hiding prints. When I set the pile on the cutting table, she looked at me and wondered out loud what I might need all that fabric for. I smiled and pulled a shield and liner out of my purse and told her about Days for Girls and what we are making and how it will change the lives of girls all over the world. She was genuinely interested and amazed at the thought of it. Then she thanked me for helping those girls. I was quite taken by her sincerity. Then she turned towards me and asked, “Would you like my button collection?” She went on to tell me that she had a button collection with many old buttons made from shells. She had collected them for more than 25 years. She said, “I’ve been thinking that I need to find homes for some of my things.” She said, “I’ve been hoping to find a very nice lady to give my buttons to.” She insisted on taking my name and address. She told me her name was Denise and she promised me she would send her buttons to me in a few weeks. She thanked me again for helping girls in Africa, then she was gone. 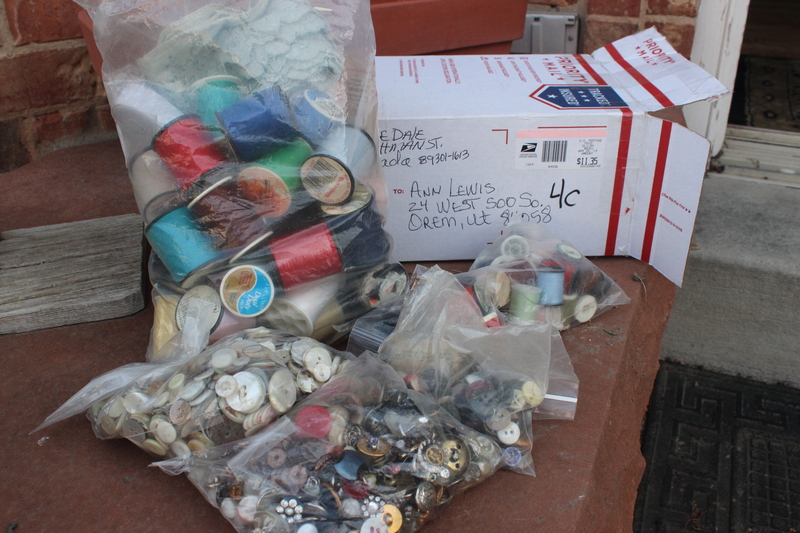 Along with the beautiful old buttons I received today were 2 bags of old colored thread. I wish I could tell Denise her thread will be used by other nice ladies who will sew kits that will go all over the world to bless the lives of girls who receive them. I think she would be very happy about that. As for me, I’m grateful for Denise, a simple wayfarer, from Ely, Nevada, who shared her treasures with me, and paid postage, ten times what she paid for her little remnant piece that day in Walmart. I will remember her–her simpleness, her kindness, her interest, and her generosity. Her treasures will make many others happy now. I hope that happiness will somehow return, in part, to her.